As our flagship program kicked off in Kenya in 2007, the off-grid market was in its infancy; consumer awareness was extremely low, and solar lantern usage was only at about 2%. Today, Kenya is the global leader in the adoption of off-grid solar technology, with approximately nearly 10 million people now meeting their basic electricity needs (Tier 1) with quality-verified off-grid solar products. The listed electricity access rates are from the 2016 GTF. However, an upcoming MTF survey puts the national access to electricity at 75% — from both grid and off-grid sources. The last decade in the off-grid sector in Kenya has been marked by tremendous innovation – both in terms of the technology and in our efforts in supporting market delivery. Our work has been continually adapting to respond to the newest developments, ensuring that more and more people have been able to benefit from these life-changing products. When we first started our work in Kenya, very little of the population knew about off-grid solar technology, so we conducted consumer education campaigns to drive awareness and demand. At the same time we provided support to the private sector seeking to enter the market. Lighting Kenya I enabled the Kenyan solar market to develop into one of the most attractive in Africa. At first, we conducted market intelligence studies as requested by the private sector, demonstrating the vast opportunities in this market. We also offered business development services to companies to help them develop and fine-tune their business models, sales and marketing strategies, as well as their product distribution networks. These outreach activities and events forged links between manufacturers, distributors and bulk buyers. To ensure the stability of the market, we followed-up by identifying and training technicians across Kenya, who were then connected with product manufacturers and distributors to provide after-sales maintenance support. Further activities have included research into the role of women both as consumers and potential distributors of solar lights. 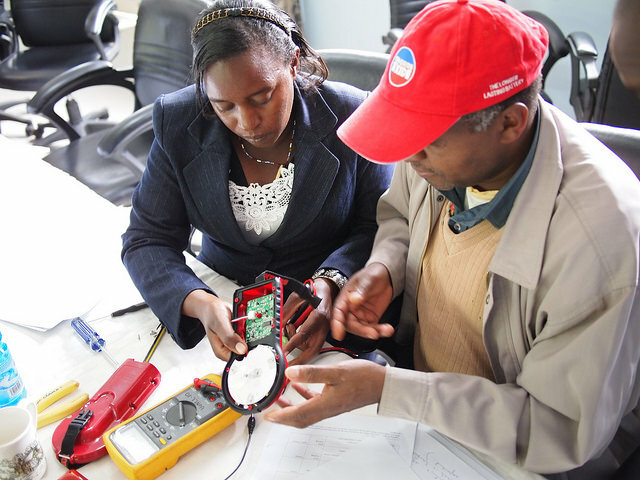 These activities led to a vibrant private sector with over 1,500 SMEs selling solar lanterns in Kenya by 2013. The up-take of solar lighting increased fourfold during this period to about 8% in 2013, with the solar lantern market growing by over 200%. Bringing about a transition from kerosene to cleaner, safer off-grid lighting systems requires knowledge among consumers on how these products operate, where they can be found and their costs and benefits. We have undertaken extensive consumer education campaigns, staged hundreds of road shows, led product discussion forums, and conducted radio campaigns to build consumer awareness across the country. The common message has been to highlight the advantages of quality-verified, clean lighting products over polluting kerosene lamps. Tapping into mass media has helped to reach a wide audience. This has been achieved through embedding quality-verified solar products into TV programs, such as the hit Makutano Junction, radio talk shows discussing the benefits of solar products, and a Christmas campaign that targeted urban and peri-urban consumers with print and TV solar lighting product messages. This campaign, which had reached over 29 million Kenyans by July 2013, was awarded the Best Non-Governmental Marketing Campaign by the Marketing Society of Kenya in 2012, and is recognized as a global best practice. Despite the successes achieved in the first phase of our program, far too many Kenyans still live without modern lighting and energy services, with a disproportionate number living in rural areas. There have been twin challenges to distribution: a lack of financing along the supply chain and difficulty reaching rural dwellers along the ‘last inch of the last mile.’ The second phase of our program, Lighting Kenya II, set out to address these issues by partnering with financial institutions including microfinance institutions, promoting financing schemes like the PAYGO model, and involving women and youth as last-mile distributors. Access to finance is critical for many consumers, who would otherwise be unable to meet upfront costs. For financing solutions to be successful, repayments are typically no higher than recurring fuel costs for kerosene lamps would be, and once paid, products require no additional expenditure – resulting in savings in the long run. Product reliability is essential to avoid potential defaults on repayments. That is why only products meeting Lighting Global Quality Standards are eligible for financing through FI partners. Pay-as-you-go (PAYGO) provides an innovative, revolutionary response to the access to finance challenge faced in particular by last-mile clients and entrepreneurs. Typically following an initial deposit, PAYGO allows consumers to pay for the power they are using via off-grid solar products in small, regular amounts – similar to their previous fuel costs – through mobile money, or in some cases scratch cards purchased at a kiosk. PAYGO has been well received by Kenyans and currently accounts for over 40% of all quality verified sales. This is due to the lack of banking requirements, the flexibility of payments, and a well-established mobile-money market. For suppliers, the ability to remotely disconnect a product depending on the credit purchased further enhances the attraction of PAYGO. For both FIs & PAYGO companies, consumer awareness around the availability of financing and information as to how to access these facilities has been critical. Linkages to prospective distributors, as well as market intelligence on business opportunities and market trends, have continued to be in high demand. Thus, we have continued to provide the market this type of support. Although the market for clean, modern off-grid lighting and energy products continues to grow in rural Kenya, uptake in the North and North Eastern countries lags far behind. At the same time the need for off-grid solutions in this region is vast with only 7% grid coverage, and poverty levels at 70%. In light of this, the World Bank and the Government of Kenya have launched the Kenya Off-Grid Solar Access Project for Underserved Counties (KOSAP) in fourteen counties. This is in line with the NEDI (the North & North Eastern Development Initiative) to complement government efforts to reduce poverty by increasing investments. Lighting Africa supported the development of KOSAP and will continue to aid its implementation. The focus of KOSAP is to provide off-grid solutions to households and public institutions, and aims to result in providing more than one million people and more than one thousand public institutions with a new or improved electricity service by 2023. To achieve this we are working with MFIs and last mile distributors/entrepreneurs to reach more remote consumers to incentivize them to move into underserved areas. The Kenyan government has now also included off-grid access into its 2018 Kenya National Electrification Strategy (KNES). Through these efforts we hope to extend the vast benefits off-grid solar products have already provided to so much off the Kenyan off-grid population, to these most underserved areas of the country as well.